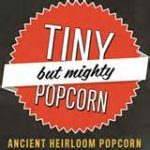 Tiny But Mighty is the name of a non-GMO heirloom popcorn that I adore. Once only available at local farmers markets, it’s now sold in grocery stores across the country. Tiny But Mighty is making a big impression in a competitive market by promoting healthier corn—for people and for the environment—that’s also very yummy, with or without organic butter. After camping and working on beautiful land in northwest Illinois in early June, Tiny But Mighty took on a different meaning for me, inviting a new perspective on what it means to feel small in an overwhelming world. It began with a story told by Nance Klehm, the owner/caretaker of an exquisite expanse of Earth she calls Pachamanka, where we held a five-day workshop. Nance shared a conversation she’d had with a Chicago friend. The friend told her, rather proudly, that he and others had just spent three hours talking about the many problems in the world. Her response to him was, “What did you decide to do about it?” He said that they had no idea but they were going to go out for brunch. Nance shook her head in disbelief. In her mind, there are so many opportunities to make a difference. Stop talking and just do something. She could give them a long list, starting with helping out at Pachamanka, where there are endless tasks to be done: tending the organic garden and orchard, keeping bees, propagating mushrooms, restoring prairie, or maintaining structures and equipment. I trust that Nance’s friend knew about her hard work on the land, and yet he didn’t see helping her as something he could do to make things better in the world. For the friend, and for many of us, I think the confusion about what we can do comes from our sense of scale. The problems of the world seem so huge, insurmountable, beyond our expertise to tackle, that we can’t even imagine what we could possibly do to make a difference. Sure, I could help you weed your garden, or pick your apples, or plant some trees, but that’s just a drop in the bucket. How will that stop climate change, or help refugees or decrease violence against people of color? What I can do seems too insignificant to matter. But tiny can be mighty! Just ask the gnats and no-see-ums at Pachamanka that swarmed me during one of the outdoor meditations. The relentless attention of these tiny insects kept me from being able to concentrate on anything other than brushing them away and praying for a healthy breeze. I couldn’t focus on the meditation we were invited to dive into as we sat on the earth and opened to the sounds of the landscape. The only thing I could really tune into was my silent prayer that these gnats would leave me alone! While the gnats annoyed in the moment, the no-see-ums that showed up later made a lasting impression. I came home with a bug-bite tattoo across my upper chest, neck and shoulders that still itched after a week of homeopathic ointments and aloe. As I tried not to scratch, I wondered (complained, actually) how something so tiny could have such a mighty impact. And then it hit me. My tiny flying friends actually had something to teach me. Rather than lamenting how small I feel in a world of overwhelm, I need to see myself as a gnat or a no-see-um and realize that I can influence the moment in a big way and can have a lasting impact. If I continue to believe that the only way to solve immense problems is with equally immense solutions, then I disempower myself. My insect friends remind me that my sense of scale needs an adjustment. Change happens because of a myriad of small steps and actions that build on each other and catalyze each other in unpredictably powerful and magical ways. I can contribute to this change by taking my own small steps every day. Another lesson from the gnats and no-see-ums is that one person isn’t nearly as effective as a swarm. There is power in numbers and in persistence. One or two gnats would not have deterred me from my meditation. Likewise, if a gnat invasion had paid me a visit, but then left after a few minutes, I would have been able to brush it off as a temporary distraction and continue with my practice. But the gnats were numerous and they kept on coming, no matter how many I smushed or swatted away (offering my silent apologies to them in the process). They didn’t let up and they worked together in a group. Likewise, the no-see-ums brought a crowd to the Kathleen feast that left no doubt about the power in their tiny stings. If they’d inflicted only a bite or two, I wouldn’t be expounding on the Tiny But Mighty message I received. There is power in numbers and in being a persistent presence! I must admit, when I think about being Tiny But Mighty, I’d much rather see myself eating popcorn than being swarmed by gnats and no-see-ums. But, I’m grateful for the itching insights that these insects helped me experience so clearly. We are tiny and mighty. We are even more mighty when we work together. We enable change when we are persistent and insistent. I want to remember these teachings every day, especially when I feel so overwhelmed with the problems of the world that the only way to cope is to go out to brunch. I will also be taking many more trips to Pachamanka to work with the land, weed the garden, plant trees, harvest apples, be in community and experience what else the blessed creatures there have to teach. Great piece Kathleen. I’m grateful for your insights. Every little bit we do makes a difference, even small actions which grow exponentially when we act as a community, can carry a mighty force.